Celebrities hunt for antiques across the UK. Jordan Banjo and Perri Kiely take time off from Diversity to get behind the wheel of a classic car and head out into the country. 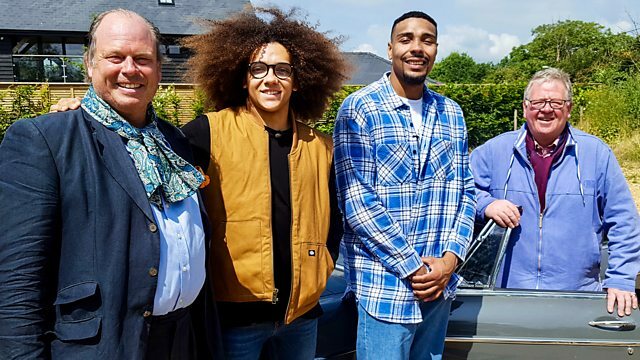 Street dancers Jordan Banjo and Perri Kiely take time off from Diversity to get behind the wheel of a classic car and head out into the country, in search of fun and profit - with excellent expert guidance, courtesy of auctioneers James Braxton and Phil Serrell. Our Britain's Got Talent winning pair, in an MG BGT and an Alfa Romeo, also discover an ancient Chinese leisure activity on a river in Cambridgeshire and get to play the fool (or jester) in Essex. Their final destination is an auction in Greenwich. This Road Trip doesn't just feature antiques. Expect strumming, boating, juggling and of course dancing.